Find My Workspace lists over 95% of the business centres market in Oxford. Simply click Request Quote to check pricing for one office, or Add to Basket for multiple offices. A complete refurbishment has been completed of the offices at this location, close to the centre of Oxford. Operated on a friendly informal basis, with a monthly license arrangement ie no lock in period. Transparent pricing, to include business and water rates, public liability insurance, 24-hour access, high-speed broadband access, heat and light and office furniture. There is on-site support management, with a kitchenette, and informal coffee area, dedicated parking places and street parking readily available. Up to three DDI telephone lines per office, in short you can turn up, plug in and go. Renovated to a high standard, this office building is situated just outside of Oxford City Centre with 24/7 security access. These quiet, modern offices have excellent work space options available along with lounge and kitchen area for tenants to use. The space is 3000 sq ft in total. 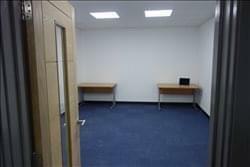 The offices come furnished and with on site management and cleaner. The centre has a WiFi connection available and benefits from being carpeted. This is an excellent base for your business to operate from!